Most of our footbags are made using state of the art synthetic suede. Synthetic suede is strong but very soft. Care must be taken to insure a long life for your footbag. Limit play on hard surfaces such as asphalt or concrete. These types of abrasive surfaces will wear out even the strongest footbag. Always bend over to pick up your footbag. Using your foot to pick it up may cause undue stress. 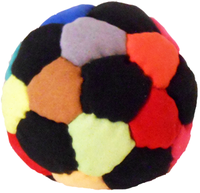 Wash your footbag to keep grit from building up on the fabric. 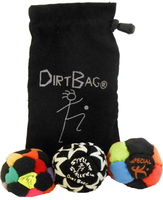 Washing your footbag regularly will help to make your footbag last much longer than our three month guaranty. This is straight from the heart folks, I have handmade more than 50,000 footbags in my sewing career and traveled the world for promotion and manufacturing carrying my favorite footbag where ever I would go. I always took care that no one mistreat my footbag and my footbags would last me several years. If you have a problem, and problems do occur, please trust us here at Flying Clipper to make sure you are a satisfied customer. Washing your Tossaball® juggle balls is a good idea. Initial washings, even when brand new is recommended, especially for the firm models and rubber filled models. Initial washing before play will smooth out the rough edges of a newly manufactured juggle ball. Tossaball juggle balls should always be washed when dirty to avoid any grit build up on the fabric surface, especially with lighter colors. Machine wash in cold water on normal setting, always washing white balls separate. Dry overnight on a window sill. Hand washing or machine drying rubber filled juggle balls is not advised. Wash separate from cloths. Hand-made, sand filled footbags will have a tendency to lose sand over time. Refilling a sand filled footbag is easy and can be done in minutes with a "scratch awl" (e.g., blunt, tapered instrument used for piercing wood or leather). Carefully ease the awl into a seam between a stitch creating a small opening to add sand. Add your sand and then to close the hole, simply roll the footbag between your hands to again pull the stitches uniformly throughout the entire footbag. 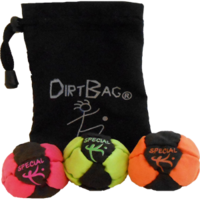 Another tip to try for sand filled footbags is to use a small amount of mink oil after your footbag has been wet and then dried. The mink oil will help the suede stay "brushed up" which will help retain the sand inside. Synthetic suede footbags can be washed in several ways. Most synthetic suedes used in footbags are not 100% color fast so washing a footbag in cold water is always a good idea. For both plastic pellet and sand filled footbags (not facile) you can put the footbag in the pocket of a pair of jeans and run it through the washer and dryer. This fabric is iron strong and actually likes to be played wet. For facile fabric which is much softer, you can use cold water and mild soap to hand wash the footbag. With facile, do not roll vigorously when wet. Facile does not like to be played wet so allow your footbag to dry on the window sill before you resume play. Wash your footbag regularly as accumulated grit will wear out your footbag. When leakage occurs in the middle of the seem, it usually indicates a missed stitch. The stitches on a Dirtbag are very close together and sometimes one might be missed. If this happens to your Dirtbag, e-mail us and we can discuss a possible replacement. Breakage of thread can occur. If this happens to your Dirtbag and its not more than 6 months old, e-mail us for a possible replacement. Leakage can occur in the corners of a well "broken in" Dirtbag.This occurs because when the Dirtbag is kicked all of the stress radiates to the corners. If this happens you can use rubber cement and a toothpick to seal the corners. Remember, a little dab will do, do not flood coat the corners and never use super glue, rubber cement only. What we call a "blow-out" can occasionally occur when the middle of the cover material (not in the seams) frays and comes apart. This happens once or twice in a blue moon, but when its your dirtbag, it just ain't right. If this happens to you within the first 6 months, e-mail us for a possible replacement. 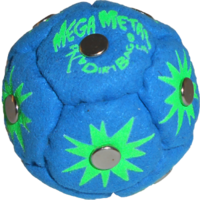 The newest innovation in footbag is metal filled footbags. Flying Clipper uses 100% stainless steel pellets in all of our metal filled offerings to insure the highest in quality. The Mighty Mite, the Juice Pro Elite, the Mega Metal Dirtbag, the Stellar Staller and now our new line of Phat Tyre footbags, we have a metel filled footbag for every category of kicking. Take a look at these Tips from Flying Clipper on how to refill a sandbag when it loses sand and how to wash a footbag.